The actuality of the abortion issue is explained in this chapter. The author expresses his determination to explore philosophical and historical background of this problem in the United States and Germany emphasising the legal development of abortion regulations. 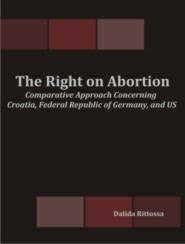 The comparative legal method was used as a proper means to illuminate Croatian controversial situation concerning the termination of pregnancy and to contribute in a modest way to probable law reforms. The objective of this thesis is to prove, despite very different substantive rules of abortion regulations in these countries, the similarities behind formal differences which witness about the universality of abortion dilemmas. Bearing this in mind, it is possible to propose suitable legal solutions and to foresee the development of this issue in the Republic of Croatia. The author presents the historical background of abortion regulations stressing it as one of the arguments used by Justice Blackmun in the opinion of the Court in Roe v. Wade case. She continues with the critical examination of this decision and explains its influence upon Doe v. Bolton case as its supplement. The Court's reasoning in Casey has been sharply criticized as a failed attempt to invent something what the judges called a reaffirmation of "essential holding". The author argues that Roe has been overruled by rejection of the trimester test, enacting the undue burden test as an appropriate standard of the Court's review of the state legislation and the extension of state's interest in the potential life during the whole gestational period. Particular limitations and restrictions on abortions were presented, such as the consent to have an abortion of the woman herself, parental and spousal consent. In the concluding subchapter, the author describes the American experience of the abortion controversy as a constant judicial compromising. The author starts dealing with the abortion issue in Germany by describing the development of the legal regulations concerned with the termination of pregnancy. She focuses on the 1975 decision of the Constitutional Court exploring how the Court interpreted the rights of the unborn life, the state's obligation to protect such a life and how the Court balanced the rights of the fetus versus rights of the mother. The 1975 decision raised several unresolved issues and one of them was that the Court was able to proclaim that the fetus is a human being and consequently that it is entitled to constitutional rights protection. Nevertheless, the terms "unborn life", "germinating life" and "incipient life" were left without precise definition. Furthermore, the concept of the objective constitutional value was used as a vehicle for transferring to the Federal Constitutional Court specific legislative functions. The European Commission on Human Rights attitude towards abortion was expressed in Brugemen and Sxheuten versus Federal Republic of Germany decision. The second abortion decision of 25 May 1993 was the reaction to abortion as a special issue after the Unification. The author again discusses the rights of the unborn life, the state`s obligation to protect it and confronting the right to life with the right to self-determination. Finally, she argues whether the counseling model was a proper solution for abortion regulations. The history of legal regulations was presented in the first subchapter with special attention given to religious influence. The 1978 Act on reproductive rights was criticized in the sense whether it is still an appropriate legal source to regulate the termination of pregnancy in today's Croatia. It was indispensable to explore the revival of abortion discussion as a consequence of transitional changes which influenced the emerging of a conservative approach within the mentality of Croatian society. No.230 Bill on Abortion presents best such attitude with the additional remark that it was proposed to Croatian Parliament with particular aim to attract public attention during the electoral campaign for the elections for the second house of Parliament. The author concludes that bearing in mind the poor public approval of the Bill proposed and the fact that the vast majority of Croats gave their consent to abortion as being justified, it seems reasonable to leave abortion regulations as they are. Legal development of abortion regulations in the US and Germany was going through the process of liberalization which demanded the changing of conservative attitude as necessary. The 1978 Croatian Act concerning procreative rights is one of the most liberal European laws and there is no need to make it more liberal. Moreover, the dispute whether we should prescribe the role of the moral arbiter to the Parliament or not has been resolved in favor of public opinion. The Croatian legislator will not be faced with a need to choose whether or not to compromise in a near future. There are no doubts that any attempt to pronounce the termination of pregnancy as illegal will be strongly opposed.